G&I Homes of Whitney Point: Starting to hunt for the perfect land to build on? Make sure you do your research before falling in love! Starting to hunt for the perfect land to build on? Make sure you do your research before falling in love! We know that a home without land to place it on isn’t going to do you much good. 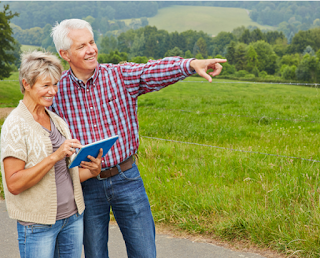 Finding suitable land is an essential step that you don’t have to take alone! We’re experienced in working with local realtors to find land that suits your wants and needs. Here are some tips to get you started on finding your dream land for your dream home! Make a list! Every great plan starts with a list. First things first…location, location, location. Be sure to research the area to determine if you can see your family living there. You might be moving from the city to the country for a life change, however positives and negatives should be considered. Some examples include…What is the travel time to and from work? How far is the nearest hospital? How long will it take you to “run to the store”, etc.? If you have a family or will be starting your own in the future, consider the school district, as well as going to after school events, classes, practices, or even just making new friends. What are the local regulations and is what you want to build allowed? There will be setbacks from fence lines that need to be considered for both town planning and building codes. These may vary, so make sure you are aware of them both. With a simple phone call to the local planning and zoning department, most offices can give you the answer to this question in a matter of minutes. Some other things to research are services such as power, water, and septic or sewer. How far away is the power supply? Contact the power distributor to find out how much it may cost to provide power to the property and they will give you a budget estimate. Connection fees have a very wide range, so it’s essential to know what the site requires. Do you have access to town water? Is the water main close or under the road? Does the soil percolate (aka “Perk”) or have access to a nearby sewer system? If a property doesn't have easy access to the local sewer system, a perc test is required to determine whether a septic system can be installed on the property. Be sure to give the county health department a call and ask what is required to install a septic system or connect to the local sewer in your area. Something else to consider is the slope of property. While the property isn’t likely to be completely flat, there can sometimes be extra costs associated with building on a slope. Extra site work could be required, as well as design elements. Although this will add interest and character to your new home, accounting for extra expenses will be required when working with a sloped site. Back to your list…start to write down your dream piece of land. Take other factors into consideration. How much land? 1 acre or more? Do you have animals? Is a pasture a must-have? Do you want a big backyard or woods? A garden? A playground or pool? How big do you want your garage and driveway? How you intend on paying for your project is huge when building a home. Many people purchase land and slowly pay it off before starting the project. Others live in an RV on the land while they pay it off. Some save up and pay cash outright for their land. However, did you know that land loans, home and construction loans can be combined into one? Well we’re here to tell you, they can! You’ll be happy to know that getting prequalified is quick and easy, letting you begin the process right away with this option. Whichever route you choose, figure out what you can afford and try hard to stick to it! It isn’t about finding land that is 100% perfect, with no risk. It’s about being completely informed, and knowing what the risks are and being okay with them. But just like any home-buying venture, if you put the time and effort into the project, you will be rewarded for it! Last thoughts: Make a good investment. Know what you are getting into. Prepare so that there are no surprises along the way. Get exactly what you want for your dream home! Happy land-hunting!